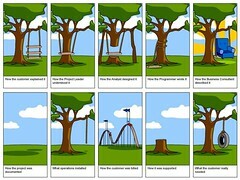 This picture (unfortunately) sums up alot of consulting engagements. This entry was posted on Thursday, September 7th, 2006 at 7:11 pm	and is filed under work. You can follow any responses to this entry through the RSS 2.0 feed. Both comments and pings are currently closed. That is very funny, and very true. Unfortunately this graphic sums up a lot of project development teams I worked with during my higher educational studies. No-one ever seemed to have the same vision, regardless of the roles they undertook. I guess the projects really did emulate the real world after hearing some the others comments. Such a shame really. marusin.com is the web home for mike marusin and has been online since 1998.